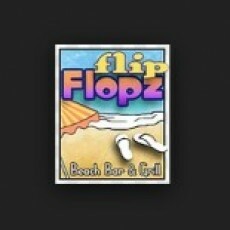 The exciting place to be is Flip Flopz Beach Bar & Grill located in Champagne Island Resort in beautiful North Wildwood, NJ. Featuring $5 kids menu items! Enjoy our delectable lunch menu on our outdoor patios with the refreshing ocean breezes, serving the most bodacious sandwiches on the island beginning at 11:00am daily. Dinner begins at 4:30pm serving fresh seafood dishes as well as many other dishes with a little Caribbean-inspired flair. Once the sun goes down, dance the night away with either a Live Band or DJ Entertainment that get the party started at 9pm Every Night of the week during the Summer season. Friday and Saturday during "off" season. Check out the Calendar of Events for specially scheduled entertainers.